Although we could take a polyphenol supplement, the benefit of getting polyphenols naturally in the diet is that healthy foods contain hundreds of other nutrients, some of which act synergistically together. Eating nutrient dense foods is so important. Various spices, berries, and cocoa are very high in polyphenols. That's good news for chocolate and berry lovers! But it turns out that apples are rich in polyphenols too --- which is great because apples are almost always available at any time of the year, plus they're grown locally. Here on our certified organic farm, we grow an assortment of apple varieties which we harvest, juice, and freeze. Rather than heat-pasteurizing the juice, we simply pass it through an ultra-violet light, allowing the juice to retain its deep flavor and terrific nutritional benefits. We quickly freeze the juice, so we can drink it throughout the year. No heat! This apple juice is alive and filled with healthy nutrients! Our juice is very different than the apple juice you find in the store. 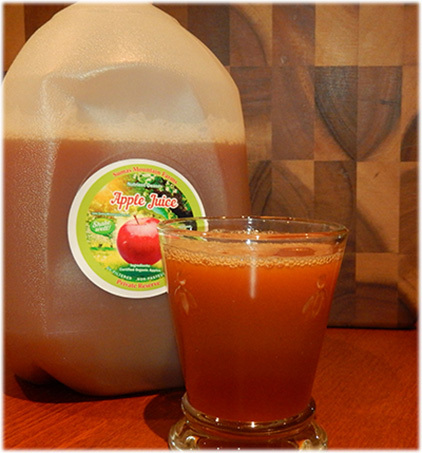 Store-bought apple juice is nearly always heat-pasteurized and severely denatured --- a dead sugar drink. In order for the juice to provide its greatest benefits to you, the nutrient and enzymatic profile of the apple needs to be kept intact. Because our juice is so rich in nutrients and flavor, it is really like nectar. I prefer to add it to water, because the flavor and sweetness is so strong. Other people like to drink it straight, undiluted. Either way, it's full of polyphenols, which helps us maintain an abundant level of nutrition even in the winter months. Something you may not know is that polyphenols are fat-soluble. You'll absorb them much better if you consume fats alongside them --- especially healthy fats, like those found in grass-only beef, outdoor raised organic pork, and healthy soy-free eggs. In this way, our apple juice is a wonderful complement to healthy meat. If you haven't tried our apple juice, now is a good time. You can buy it here.